I am super excited about mediation this coming Sunday! 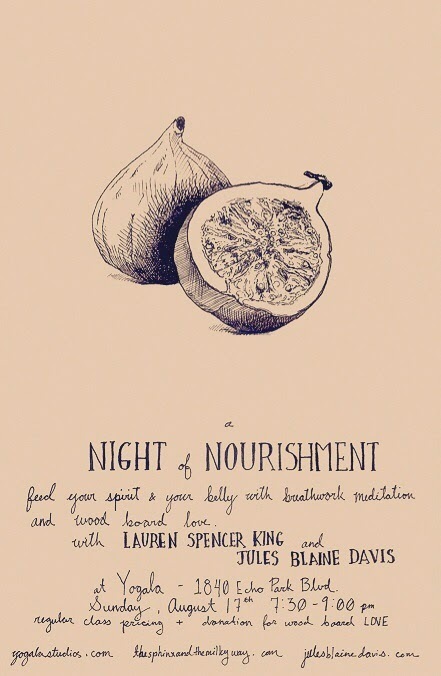 There will be a regular meditation class with the topic of how you nourish yourself, and then after we will get to enjoy a feast of delicious and local food provided by the amazing, hilarious, and wise "kitchen healer", Jules! AND - it's the price of a regular class at Yogala! How can you pass that up?! We will start right at 7:00, so please arrive on time. And bring a friend! Let's nurture the importance of sharing and community! So looking forward to this! Come with an open heart and an empty belly!